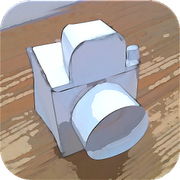 Besides added video capabilities, Paper Camera has also received support for Android Beam, allowing users to transfer images seamlessly between devices powered by Ice Cream Sandwich. Paper Camera also stores photos and videos in separate folders now, adding a bit of organization to your novelty gallery. If you're already a fan of Paper Camera, just click below and grab the update. If you haven't experienced the fun of Paper Camera yet, though, it's definitely worth checking out, and is well worth its $1.99 price point.